Carpal tunnel syndrome (CTS) is the most common peripheral nerve entrapment word wide. The general trend for this condition is progressive worsening, although spontaneous regression of symptoms is possible. Patients can be diagnosed quickly and respond well to treatment but the best means of integrating clinical, functional, and anatomical information for selecting treatment choices has not yet been identified. The eight carpal bones are oriented in two rows between the ulna and radius and the metacarpal bones. These form an articulated connection between the forearm and the hand. Go here form more nuanced discussion of CT anatomy including its normal variations found in general and clinical populations. 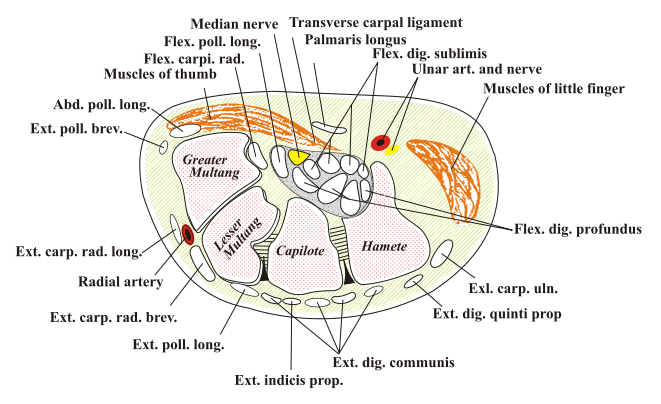 Fig.2 Transverse plane view of carpal tunnel. The estimated prevalence of CTS is 4-5% of the population.There are two peak age frequencies: the first and biggest peak is between 45 and 59 years of which 75% is female. The second age peak is between 75 and 84 years, of which 64% is femal.Most cases of CTS are idiopathic, A portion of incidences of CTS are caused by pathological changes in structures passing through the carpal tunnel or the tissues forming it's walls. Finally, considerable proportion of CTS cases are linked to pathological demands on wrist motion. Idiopathic CTS occurs more frequently in females (65–80%) and between the ages of 40 and 60 years; 50–60% of the cases are bilateral. The bilateral characteristic increases in frequency with the duration of symptoms. Idiopathic CTS is correlated with hypertrophy of the synovial membrane of the flexor tendons caused by degeneration of the connective tissue, with vascular sclerosis, edema and collagen fragmentation. The histological changes were thought to be suggestive of dynamic factors as repetitive strain. 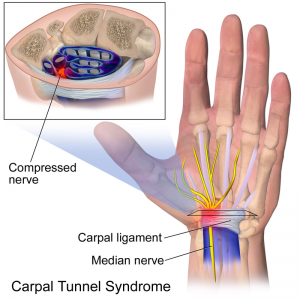 Any condition that modifies the walls of the carpal tunnel may cause compression of the median nerve. Abnormalities of fluid distribution: pregnancy in 0.34% to 25% of the cases, especially in the third trimester, with frequent signs of deficit in 37–85% of the cases; hypothyroidism and chronic kidney failure (arteriovenous fistula). Exposure to vibration is one of the lesser predisposing factors. The ultrastructural consequences comprise microcirculatory compression problems and intraneural edema following injury of the myelin and axons. threshold limit values ACGIH® TLV® for Hand Activity Levels. Fig. 3 Right hand sensory distribution. Patients may notice aggravation of symptoms with static gripping of objects as phone or steering wheel but also at night or early in the morning. Many patients will report improvement of symptoms following shaking or flicking of their hand. The final symptoms are weakness and atrophy of muscles thenar eminence. Fig. 4. Location of C7 dermatome. 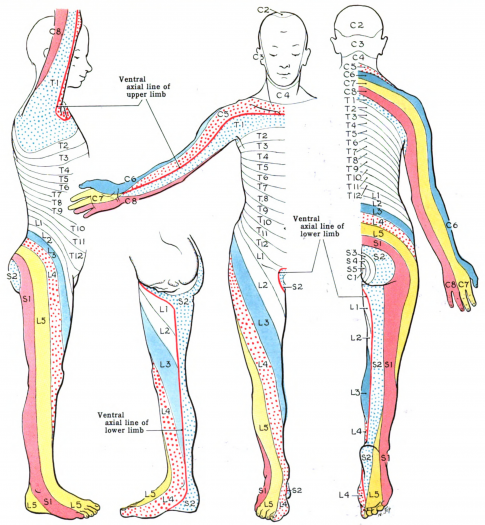 Note overlap with median nerve sensory distribution of hand. Process of differential diagnosis should give consideration to all conditions which could potentially cause a dysfunction of median nerve, or its contributories in brachial plexus, C 5 to 8 nerve roots and central nervous system. For example: an injury of nn. digitales in the palm, pronator teres syndrome or cervicobrachial syndrome, particularly when C7 nerveroot is involved. Even though the neurological symptoms of this pathology have a distinct dermatomal character, the C7-C8 dysfunction with radiculopathy will overlap with CTS in location of paraesthesia of hand as demonstrated in Fig. 3 and 4. There are several questionnaires available to determine the outcome measures for CTS. The four questionnaires below are all supported by studies with level of evidence 2A or 2B. Only the study of Levine et al. , describing the BCTQ, has level of evidence 4. This questionnaire is, however supported by other, higher level studies as well. The reliability, validity and responsiveness of the BCTQ has been found to be very good by several studies, such as the report of the University of Oxford16 and the studies of Sambandam et al. , Bakhsh et al. and Greenslade et al. . The DASH questionnaire is also found to be a valid and reliable test with good responsiveness. Bakhsh et al. however found the DASH questionnaire to be less responsive than the BCTQ. A short 12 item version was also validated for CTS and several other common hand conditions to reduce the burden and promote its use in clinical setting. Clinical prediction rules (CPR), specifically for the Carpal Tunnel Syndrome, are a reliable examination method. It consists of five tests. Wainner et al. found that the CPR is more useful for diagnosis of CTS than any single test item. Using CPR results is posttest probability changes up to 56%. Other than the CPR, there are several provocative tests and the thenar atrophy observation that can be used in the clinical examination of a CTS patient. In Table 2  you find the sensitivity and specificity rates of all the tests explained below. Non-surgical treatment comprises oral steroids  , corticosteroid injections , NSAID , diuretics , vitamin B6  and splinting/hand brace . Huistede et al  concluded that surgical treatment seems to be more effective than splinting and anti-inflammatory drugs plus hand therapy in the midterm and long term to treat CTS . However, there is no unequivocal evidence that suggestsone surgical treatment is more effective than the other. The two main manners to decompress the median nerve by surgery are the open carpal tunnel release (OCTR) and the endoscopic carpal tunnel release (ECTR). During the OCTR the 2 cm incision is performed through skin, palmar fascia to access and release transverse carpal ligament. The less invasive ECTR allows to minimize the size of skin incision while releasing the transverse ligament. During this operation the surgeon can use the single-portal technique and the two-portal technique. The first technique uses one incision, the second one two. Using a camera, surgeons can see what happens inside. Benson et al  says that with both techniques (OCTR and ECTR) the structural complications for nerves, blood vessels or tendons are low. According to Chen et al  there are no obvious statistical differences in relief of symptoms (pain en paraesthesia), recovery of grip strength a reoperation rate. Though, two articles with moderate to strong level of evidence declares the ECTR causes a faster return to work  and a better recovery of pinch strength. Patients with mild to moderate symptoms do not need to be immediately operated but can be effectively treated in a primary care environment   Physical therapy typically consists of modifications of activities and the work place (ergonomic modifications) , patient education, carpal bone and nerve mobilisation ,, ultrasound  and electromagnetic field therapy  and splinting. It’s important to mention that, in general, the evidence of the effectiveness of the exercise and mobilization interventions is limited and very low in quality. The physical therapist should always inform the patient about the limited evidence of effectiveness and safety as well as availability of surgical option without the pre-requite conservative therapy where appropriate. . The effectiveness of ultrasound varies between the studies and most of the time the evidence is low. According to Page et al  there’s poor and limited evidence about the effect of therapeutic ultrasound. There is insufficient evidence that therapeutic ultrasound has a greater benefit than other non-surgical treatments, such as splinting, exercises or oral drugs. It is important to pay attention to the cause of the CTS. Physical therapists should give advice in task modification, like taking fufficient rest and variation of movements. Burke et al  declare that often simple obvious alterations to the working practice can be beneficial in controlling milder symptoms of CTS. Peter et al  declare that evidence about post-operative rehabilitation is also limited. Their reviewed interventions handle physical applications, differences between kinds of immobilisation and multimodal hand therapy. None of them seems to have a prevailing benefit. Treatment should be discontinued when shown to be ineffective and appropriate, evidence based discharge recommendations should be made. CTS symptoms typically escalate over a longer term despite conservative treatment. Surgical interventions for appropriate patients have been shown to be safe and more effective than any conservative intervention, Clinicians should be aware that constant tingling or numbness is associated with significant compression of median nerve. Prolonged duration of such symptoms may lead to irreversible changes in its internal structure, affecting effectiveness of surgery and leaving individuals with chronic symptoms and muscle atrophy of thenar eminence. Patients should be followed by their general practitioners to discuss surgical treatment options when necessary and desired. ↑ Padua L, Coraci D, Erra C, Pazzaglia C, Paolasso I, Loreti C, Caliandro P, Hobson-Webb LD. Carpal tunnel syndrome: clinical features, diagnosis, and management. The Lancet Neurology. 2016 Nov 1;15(12):1273-84. ↑ 2.0 2.1 2.2 2.3 Chammas M, Boretto J, Burmann LM, Ramos RM, Neto FCS, Silva JB. Carpal tunnel syndrome – part 1 (anatomy, physiology, etiology and diagnosis). Revista brasileira de Ortopedia (English edition) 2014 September-October; 49 (5):429-436. ↑ Shiel WC. Carpal tunnel syndrome [internet]. 2008 [2013 November 13 ; 2015 April 4]. Available from : http://www.emedicinehealth.com/carpal_tunnel_syndrome/article_em.htm. ↑ Moses KP, Banks JC, Nava PB, Petersen D. Altals of clinical gross anatomy. Elsevier Mosby; 2008. Chapter 23, Wrist and hand joints; p.260-265. ↑ Carpal tunnel syndrome fact sheet [internet]. Bethesda; 2012 July [2015 April 17; 2015 april 20]. Available from: http://www.ninds.nih.gov/disorders/carpal_tunnel/detail_carpal_tunnel.htm#280913049. ↑ Michelsen H, Posner MA. Medical history of carpal tunnel syndrome. Hand clinics. 2002 May 1;18(2):257-68. ↑ Bagatur A.E., Zorer G. The carpal tunnel syndrome is a bilateral disorder. J Bone Joint Surg Br. 2001;83(5):655–658. ↑ Schuind F., Ventura M., Pasteels J.L. Idiopathic carpal tunnel syndrome: histologic study of flexor tendon synovium. J Hand Surg Am. 1990;15(3):497–503. ↑ Falkiner S., Myers S. When exactly can carpal tunnel syndrome be considered work-related? ANZ J Surg. 2002;72(3):204–209. ↑ 10.0 10.1 Lozano-Calderon S., Anthony S., Ring D. The quality and strength of evidence for etiology: example of carpal tunnel syndrome. J Hand Surg Am. 2008;33(4):525–538. ↑ 11.0 11.1 Knoll V.D., Allan C., Trumble T.E. Trans-scaphoid perilunate fracture dislocations: results of screw fixation of the scaphoid and lunotriquetral repair with a dorsal approach. J Hand Surg Am. 2005;30(6):1145–1152. ↑ Monsivais J.J., Scully S. Rotary subluxation of the scaphoid resulting in persistent carpal tunnel syndrome. J Hand Surg Am. 1992;17(4):642–644. ↑ Dyer G., Lozano-Calderon S., Gannon C., Baratz M., Ring D. Predictors of acute carpal tunnel syndrome associated with fracture of the distal radius. J Hand Surg Am. 2008;33(8):1309–1313. ↑ Henry M., Stutz C. A prospective plan to minimise median nerve related complications associated with operatively treated distal radius fractures. Hand Surg. 2007;12(3):199–204. ↑ Fassler P.R., Stern P.J., Kiefhaber T.R. Asymptomatic SLAC wrist: does it exist? J Hand Surg Am. 1993;18(4):682–686. ↑ 16.0 16.1 Chammas M. Le poignet rhumatoide. Chir Main. 2005;24(6):275–298. ↑ Hassanpour S.E., Gousheh J. Mycobacterium tuberculosis-induced carpal tunnel syndrome: management and follow-up evaluation. J Hand Surg Am. 2006;31(4):575–579. ↑ Brutus J.P., Baeten Y., Chahidi N., Kinnen L., Ledoux P., Moermans J.P. Atypical mycobacterial infections of the hand: report of eight cases and literature review. Chir Main. 2001;20(4):280–286. ↑ Chidgey L.K., Szabo R.M., Wiese D.A. Acute carpal tunnel syndrome caused by pigmented villonodular synovitis of the wrist. Clin Orthop Relat Res. 1988;(228):254–257. ↑ Jenkins P.J., Sohaib S.A., Akker S., Phillips R.R., Spillane K., Wass J.A. The pathology of median neuropathy in acromegaly. Ann Intern Med. 2000;133(3):197–201. ↑ Chammas M., Bousquet P., Renard E., Poirier J.L., Jaffiol C., Allieu Y. Dupuytren's disease, carpal tunnel syndrome, trigger finger, and diabetes mellitus. J Hand Surg Am. 1995;20(1):109–114. ↑ 22.0 22.1 Allieu Y., Chammas M., Idoux O., Hixson M., Mion C. Carpal tunnel syndrome and amyloid tenosynovitis in patients undergoing chronic hemodialysis. Evaluation and treatment apropos of 130 cases. Ann Chir Main Memb Super. 1994;13(2):113–121. ↑ Gerster J.C., Lagier R., Boivin G., Schneider C. Carpal tunnel syndrome in chondrocalcinosis of the wrist. Clinical and histologic study. Arthritis Rheum. 1980;23(8):926–931. ↑ Stolp-Smith K.A., Pascoe M.K., Ogburn P.L., Jr. Carpal tunnel syndrome in pregnancy: frequency, severity, and prognosis. Arch Phys Med Rehabil. 1998;79(10):1285–1287. ↑ M’Bappé P. Complications neurologiques de la grossesse (sciatique exclue) Rev Rhum Ed Fr. 2005;72:719–724. ↑ 27.0 27.1 Bradley W.G., Walton J.N. Neurologic manifestations of thyroid disease. Postgrad Med. 1971;50(3):118–121. ↑ Floyd T., Burger R.S., Sciaroni C.A. Bilateral palmaris profundus causing bilateral carpal tunnel syndrome. J Hand Surg Am. 1990;15(2):364–366. ↑ Schon R., Kraus E., Boller O., Kampe A. Anomalous muscle belly of the flexor digitorum superficialis associated with carpal tunnel syndrome: case report. Neurosurgery. 1992;31(5):969–970. ↑ Pierre-Jerome C., Bekkelund S.I., Husby G., Mellgren S.I., Osteaux M., Nordstrom R. MRI of anatomical variants of the wrist in women. Surg Radiol Anat. 1996;18(1):37–41. ↑ Moneim M.S., Gribble T.J. Carpal tunnel syndrome in hemophilia. J Hand Surg Am. 1984;9(4):580–583. ↑ Bindiger A., Zelnik J., Kuschner S., Gellman H. Spontaneous acute carpal tunnel syndrome in an anticoagulated patient. Bull Hosp Jt Dis. 1995;54(1):52–53. ↑ Paley D., McMurtry R.Y. Median nerve compression by volarly displaced fragments of the distal radius. Clin Orthop Relat Res. 1987;(215):139–147. ↑ Bland J.D. The relationship of obesity, age, and carpal tunnel syndrome: more complex than was thought? Muscle Nerve. 2005;32(4):527–532. ↑ Gelberman R.H., Hergenroeder P.T., Hargens A.R., Lundborg G.N., Akeson W.H. The carpal tunnel syndrome. A study of carpal canal pressures. J Bone Joint Surg Am. 1981;63(3):380–383. ↑ Mackinnon S.E. Pathophysiology of nerve compression. Hand Clin. 2002;18(2):231–241. ↑ Kerwin G., Williams C.S., Seiler J.G., 3rd. The pathophysiology of carpal tunnel syndrome. Hand Clin. 1996;12(2):243–251. ↑ Andersen J.H., Fallentin N., Thomsen J.F., Mikkelsen S. Risk factors for neck and upper extremity disorders among computers users and the effect of interventions: an overview of systematic reviews. PLoS ONE. 2011;6(5):e19691. ↑ Kozak A, Schedlbauer G, Wirth T, Euler U, Westermann C, Nienhaus A. Association between work-related biomechanical risk factors and the occurrence of carpal tunnel syndrome: an overview of systematic reviews and a meta-analysis of current research. BMC musculoskeletal disorders. 2015 Dec;16(1):231. ↑ Gray, Henry. Anatomy of the Human Body. Philadelphia: Lea & Febiger, 1918; Bartleby.com, 2000. www.bartleby.com/107/. [Date of Printout]. ↑ 41.0 41.1 41.2 Jesus Filho AG, do Nascimento BF. Comparative study between physical examination, electroneuromyography and ultrasonography in diagnosing carpal tunnel syndrome. Revista Brasileira de Ortopedia (English Edition). 2014 September–October; 49(5): 446–451. ↑ 42.0 42.1 42.2 42.3 42.4 42.5 42.6 Ashworth NL, MBChB. Carpal Tunnel Syndrome Clinical Presentation [Internet]. 1994 [Updated 2014 Aug 25; cited 2015 March 20].fckLRAvailable from:fckLRhttp://emedicine.medscape.com/article/327330-clinical. ↑ 43.0 43.1 Krom de M.C.T.F.M., MD, KnipschildP.G. Prof. Efficacy of provocative tests for diagnosis of carpal tunnel syndrome. The Lancet. 1990 Feb 17; Vol.335 Issue 8686: 393-395. ↑ Ashworth NL, MBChB. Carpal Tunnel Syndrome Differential Diagnoses [Internet]. 1994 [Updated 2014 Aug 25; cited 2015March 20] Available from: http://emedicine.medscape.com/article/327330-differntial . ↑ Visser LH, Smidt MH, Lee ML. High-resolution sonography versus EMG in the diagnosis of carpal tunnel syndrome. J Neurol Neurosurg Psychiatry. 2008;79:63-67. ↑ Simpson JA. Electrical signs in the diagnosis of carpal tunnel and related syndromes. J Neurol Neurosurg Psychiatry. 1956 Nov; 19(4):275-280. ↑ Ashworth NL, MBChB. Carpal Tunnel Syndrome Workup [Internet]. 1994 [Updated 2014 Aug 25; cited 2015 March 20].fckLRAvailable from: http://emedicine.medscape.com/article/327330-workup. ↑ 49.0 49.1 Levine DW, Simmons BP, Koris MJ, Daltroy LH, Hohl GG, Fossel AH, Katz JN. A self-administered questionnaire for the assessment of severity of symptoms and functional status in carpal tunnel syndrome. J Bone Surg Am. 1993 Nov; 75(11):1585-92. ↑ 50.0 50.1 50.2 50.3 50.4 50.5 50.6 50.7 Hadi M, Gibbons E, Fitzpatrick R. A structured review of patient-reported outcome measures for procedures for carpal tunnel syndrome. Oxford: Departmet of Public Health (University of Oxford); 2011. 33p. ↑ 51.0 51.1 51.2 51.3 51.4 51.5 51.6 51.7 Sambandam SN, Priyanka P, Gul A, Ilango B. Critical analysis of outcome measures used in the assessment of carpal tunnel sundrome. Int Orthop. 2008 Aug; 32(4):497-504. ↑ 52.0 52.1 Bakhsh H, Ibrahim I, Khan W, Smitham P, Goddard N. Assessment of validity, reliability, responsiveness and bias of three commonly used patient-reported outcome measures in carpal tunnel syndrome. Ortop traumatol Rehabil. 2012 Jul/Aug; 14(4):335-340. ↑ 53.0 53.1 Greenslade JR, Mehta RL, Belward P, Warwick DJ. Dash and Boston questionnaire assessment of carpal tunnel syndrome outcome: what is the responsiveness of an outcome questionnaire? JHS. 2004 Apr; 29(2):159-164. ↑ Hobby JL, Watts C, Elliot D. Validity and responsiveness of the patient evaluation measure as an outcome measure for carpal tunnel syndrome. J Hand Surg Br. 2005 Aug; 30(4):350-354. ↑ Shauver MJ, Chung KC. The Michigan Hand Outcomes Questionnaire (MHQ) after 15 years of field trial. Plastic and reconstructive surgery. 2013 May;131(5):779e. ↑ Wainner RS, Fritz JM, Irrgang JJ, Delitto A, Allison S, Boninger ML. Development of a clinical prediction rule for the diagnosis of carpal tunnel syndrome. Archives of Physical Medicine and Rehabilitation. 2005 Apr; 86(4): 609-618. ↑ 58.0 58.1 Makanji HS, Becker SJE, Mudgal CS, Jupiter JB, Ring D. Evaluation of the scratch collapse test for the diagnosis of carpal tunnel syndrome. JHS. 2014 Feb; 39(2):181-186. ↑ Phalen GS. The Carpal-tunnel Syndrome: Clinical Evaluation of 598 Hands. Clinical Orthopaedics. 1972 Mar/Apr; 83:29-40. ↑ 60.0 60.1 Phalen GS. The Carpal-Tunnel Syndrome – seventeen years’ of experience in diagnosis and treatment of six hundredfifty-four hands. J Bone Joint Surg Am. 1966 Mar; 48(2):211-228. ↑ 61.0 61.1 61.2 61.3 61.4 Diagnosing CTS; Provocative tests [internet]. NHS; 2010 [Updated 2011 June 11]. Available from: http://www.carpal-tunnel.net/diagnosing/provocative. ↑ 62.0 62.1 62.2 Romito K. Physical Exam for Carpal Tunnel Syndrome [internet]. Healthwise; 2005 [Updated 2012 Oct 2]. Available from: fckLRhttp://www.webmd.com/pain-management/carpal-tunnel/physical-exam-for-carpal-tunnel-syndrome. ↑ 63.0 63.1 Urbano FL. Tinel’s sign and Phalen’s Maneuver: Physical Signs of Carpal Tunnel Syndrome. Hospital Physician. 2000 Jul: 39-44. ↑ 65.0 65.1 How to Use a Hand Elevation Test to Detect Carpal Tunnel Syndrome [internet]. Demand Media; 1999-2015. Available from: http://www.ehow.com/how_2088359_use-hand-elevation-test-detect.html. ↑ 66.0 66.1 Cheng CJ, Mackinnon-Patterson B, Beck JL, Mackinnon SE. Scratch Collapse Test for Evaluation of Carpal and Cubital Tunnel Syndrome. JHS. 2008 Nov; 33(9):1518-1524. ↑ 67.0 67.1 67.2 67.3 67.4 67.5 67.6 67.7 67.8 67.9 O’Connor D, Marshall SC, Massy-Westropp N, Pitt V. Non-surgical treatment (other than steroid injection) for carpal tunnel syndrome (Review). The Cochrane database of systematic reviews. 2012; volume (7):1-106. ↑ 68.00 68.01 68.02 68.03 68.04 68.05 68.06 68.07 68.08 68.09 68.10 68.11 Huisstede BM, Hoogvliet P, Randsdorp MS, Glerum S, van Middelknoop M, Koes BW. Carpal Tunnel Syndrome. Part I: Effectiveness of Nonsurgical Treatments–A Systematic Review. Archives of physical medicine and rehabilitation. 2010 Jul; 91(7):981-1004. ↑ 69.0 69.1 69.2 69.3 69.4 Piazzini DB, Aprile I, Ferrara PE, Bertolini C, Tonali P, Maggi L, Rabini A, Piantelli S, Padua L. A systematic review of conservative treatment of carpal tunnel syndrome. Clinical rehabilitation. 2007 Apr; 21(4):299-314. ↑ Huisstede BM, Randsdorp MS, Coert JH, Glerum S, van Middelknoop M, Koes BW. Carpal Tunnel Syndrome. Part II: Effectiveness of Surgical Treatments—A Systematic Review. Archives of physical medicine and rehabilitation. 2010 Jul; 91(7):1005-24. ↑ Benson LS, Bare AA, Nagle DJ, Harder VS, Williams CS, Visotskv JL. Complications of Endoscopic and Open Carpal Tunnel Release. Arthroscopy. 2006 Sep; 22(9):919-24. ↑ 72.0 72.1 Chen L, Duan X, Huang X, Lv J, Peng K, Xiang Z. Effectiveness and safety of endoscopic versus open carpal tunnel decompression. Archives of orthopaedic and trauma surgery. 2014 Apr; 134(4):585-93. ↑ Saw NL, Jones S, Shepstone L, Meyer M, Chapman PG, Logan AM. Early outcome and cost-effectiveness of endoscopic versus open carpal tunnel release: a randomized prospective trial. Journal of hand surgery. 2003 Oct; 28(5):444-9. ↑ 74.0 74.1 Oskouei AE, Talebi GA, Shakouri SK, Ghabili K. Effects of Neuromobilization Maneuver on Clinical and Electrophysiological Measures of Patients with Carpal Tunnel Syndrome. Journal of physical therapy science. 2014 Jul; 26(7):1017-22. ↑ 75.0 75.1 75.2 Burke FD, Ellis J, McKenna H, Bradley MJ. Primary care management of carpal tunnel syndrome. Postgraduate medical journal. 2003 Aug; 79 (934):433-7. ↑ 76.0 76.1 76.2 Page MJ, O’Connor D, Pitt V, Massy-Westropp N. Exercise and mobilisation interventions for carpal tunnel syndrome. Cochrane Database Syst Rev. 2012;6:CD009899. ↑ Page MJ, Massy-Westropp N, O'Connor D, Pitt V. Splinting for carpal tunnel syndrome. ↑ Page MJ, O’Connor D, Pitt V, Massey-Westropp N. Therapeutic ultrasound for carpal tunnel syndrome (Review). The Cochrane database of systematic reviews. 2013 Mar; 28(3):1-156. ↑ Peters S, Page MJ, Coppieters MW, Ross M, Johnston V. Rehabilitation following carpal tunnel release (Review). The Cochrane database of systematic reviews. 2013 Jun; 5(6): 1-147.